Okay, I'm truly sorry not to be posting a Bachelorette recap today, but I'm off on a trip – first to San Diego and then to Vancouver and Victoria – and will be watching it late. I'll report back on all that when I return, BUT, in the meantime, I thought I at least owed you some kind of nugget. 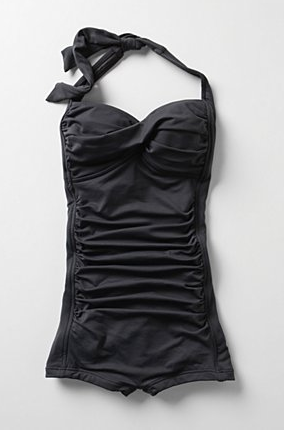 Above, behold the Natalie One-Piece from Anthropologie, which I KID YOU NOT is the best fitting, most flattering bathing suit that I have ever encountered in my entire life. It comes in multiple colors (I have the polkadots!) and it's all old Hollywood and stuff, but best of all, it seems to be on sale right now. I feel like I should buy 10 to wear over the next decade. That's how good this thing looks on.